Weekly interviews from prominent amateurs, coaches, and personalities from the game of golf! The Back of the Range Golf Podcast, hosted by Ben Adelberg, is a weekly interview-driven podcast focusing on the game of golf. Prominent amateurs and professionals, coaches, and personalities from the game share their stories each and every week. Sometimes, the best stories in golf aren't found on tour. You'll find them at The Back of the Range. A fun and informative interview with Deron Zendt. We discuss his start in the game and his career as a superintendent. From starting at Riviera in Los Angeles, hijinks at the Sullivan Invitational at Lebanon CC, to winning the Superintendent National Championship in Orlando, we cover it all....including chinch bugs and manganese. This week's guest is TJ Shuart from Fort Lauderdale, Florida. All that TJ has done is participate in 11 USGA championships and is one of the last men to accomplish the unique feat of qualifying for the US Amateur, US Mid-Amateur, and US Amateur Public Links in the same season. He played collegiately at Loyola University and has some great stories about some matches against current professionals like Ricky Barnes and Ryan Moore. Additionally, he launched his own amateur golf tour here in South Florida and we get into that as well. Our guest this week is Duke Butler IV from Jacksonville, Florida. Duke grew up in Houston, TX but soon found his way to the University of Florida and played collegiate golf with the likes of Matt Every and Camilo Villegas. He participated in several USGA events and shared some great stories about those experiences. He also has some experience working behind the scenes on some PGA and Web.com events...so he has some insight on how these tournaments function and all of the hard work necessary to have them come off flawlessly. With the Winter Olympics in full swing, we decided we needed a Canadian as a guest this week. This week's guest is Scott Kennedy, originally from Peterborough, Ontario, Canada. Scott played collegiately at Florida Atlantic University before transitioning into the nightclub and restaurant industry. He shared some great stories from his memorable experience playing in the 250th British Amateur at St. Andrews and most recently, his USGA Four-Ball run at Pinehurst. Oh, and he also offered some advice to Sergio Garcia for this year's Champions Dinner at The Masters. Here's a hint: It's not a tofu burger. A very insightful interview with Ryan Jamison. Currently, he is the Asst. Coach for the Stanford Men's Golf Team. Before arriving at Stanford, all he did was lead the Nova Southeastern University Men's team to a Division II National Championship in 2015 which awarded him Coach of the Year honors. We talk about his career as a coach and hear some stories about some Stanford Golf alums that I'm sure everyone will love to hear. This week's guest is Kevin Hammer from Boynton Beach, Florida. Kevin became an AJGA Junior All-American and also helped the University of Florida capture two SEC championships and one National Championship. We got into several topics ranging from the current state of country clubs, junior golf, and his philosophy on introducing the game to today's youth. We caught up this week with Willie Spicer, one of my old college teammates from St. Thomas University. Willie comes from a golfing family and played golf at Seton Hall University. We share some old stories from the team, his upbringing in the game, and playing the "cocktail circuit" at places like Baltusrol. He also tells us how to make the perfect Transfusion. Doug Snoap discusses his start in the game growing up in Michigan and all of the fortunate breaks that came his way and eventually led to him playing college golf in Florida. He has racked up numerous achievements in the amateur game, but the highlight came from his unlikely and amazing story from the 2012 U.S. Senior Open. A great conversation with David Pezzino, the head coach of the UCONN Men's Golf Team. From his start as the player-coach at St. Thomas University in Miami, Florida, he chronicles his coaching career that led him to stints at Florida International, Illinois, and UCONN, where he has coached for over a decade. He shares his thoughts on coaching, junior golf, and the people that have helped his career along the way. Our first episode features Steve Anderson from Hobe Sound, Florida. Steve is a former Ohio State Amateur Champion, All-American from The Ohio State University, and one of the past decade's most dominant amateurs in the state of Florida. Impressive credentials? Yes. But the stories he shared during this episode are even better. Enjoy! 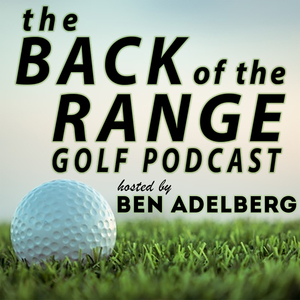 Welcome to the Back of the Range Golf Podcast hosted by Ben Adelberg! Just some quick details on how the podcast came to be and the direction we will take in 2018. In short, it will be a weekly interview-driven podcast focusing on the game of golf. Prominent amateurs, teaching professionals, coaches, and personalities from the game share their stories each and every week. Sometimes, the best stories in golf aren't found on tour. You'll find them at The Back of the Range.